It was the most unlikeliest of days for me. Hundreds of strangers came up to me. And we were able to lay to rest any anxieties or inhibitions in those moments — about other people, about the unknown, about ourselves, about violating other people’s personal spaces or not understanding their beliefs. We could simply meet. Say hi. Snap a memory of that moment. Did New Yorkers take him into their hearts? Or was he a subject of spectacle? 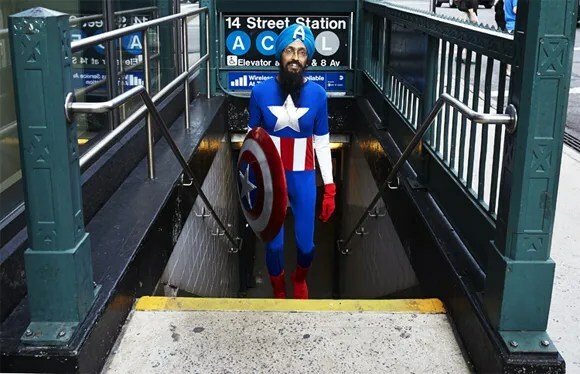 Either way, it seems a positive experience for Singh himself and for photographer Fiona Aboud who is planning a collection of Sikhs: An American Portrait that will include Singh. This entry was posted on Friday, October 18th, 2013 at 4:17 pm	and tagged with islamophobia, sikhism, Vishavjit Singh and posted in cultural, online. You can follow any responses to this entry through the RSS 2.0 feed. « Islam and Comics: Sensing a Trend?